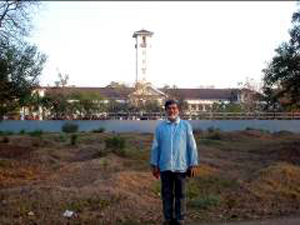 I was invited to give an Institute lecture at IIT Kharagpur on February 28, 2011. It was on the invitation of my dear friend Dr. Arun Majumdar, the deputy director of IIT, Kharagpur and Prof. P. B. S. Bhadoria, the head of Rural Development Center. This invitation gave us (my wife Nandini was accompanying me) an opportunity to visit Kolkata and also Sikkim – a state that I had never visited. On reaching Kolkata we were put up in a swanky guest house of IIT Kharagpur in Salt Lake city area of Kolkata. Though this was my third visit to Kolkata, I had never seen Acharya J. C. Bose Museum. Dr. Kalyan Mukherjee, the Director of J. C. Bose Museum was kind enough to open the museum for us on Saturday (it is closed on Saturday and Sunday) and gave us an extensive tour. It was fascinating to see the great contributions of J. C. Bose. He was a renaissance man. Besides inventing the radio, he was also an architect and a science fiction writer. Nicola Tesla invented the radio independently nearly at the same time and had filed a patent for it. Nevertheless Marconi took the credit for this invention and got the Nobel Prize. However Tesla fought tenaciously for his patent and so in 1947 the supreme court of U.S.A. gave the verdict in his favor. That was not the case with J. C. Bose who never filed any patents for his inventions. I was also pained to hear from Dr. Kalyan Mukherjee that J. C. Bose’s notebooks (in which he wrote down most of his ideas and inventions) are not available since there is a legal dispute going on between the trustees of his house (where supposedly the notebooks are kept) and J. C. Bose Institute which was originally supposed to have got their custody. This has robbed the future generations of the great ideas of J. C. Bose. In Kolkata we also saw Rabindranath Tagore’s ancestral house and the magnificent Victoria Memorial Hall. IIT Kharagpur (IITKgp) – the oldest IIT of India was the only IIT I had not visited and giving the Institute lecture gave me an opportunity to do so. IITKgp is situated in a rural setting slightly outside Kharagpur town and has about 1300 acres of land of which 250 acres are farmland. The settings are idyllic and early morning weather in February end was crisp and cool. We therefore enjoyed long morning walks in the tree-filled campus. IITKgp is also the only IIT in India which has Agricultural Engineering department. Dr. R. Singh, the Chairman of Agricultural and Food Engineering department requested me to meet the faculty. Thus about 20 faculty members were present in the meeting and we had a very interesting brainstorming session on various issues on how to make agricultural engineering attractive to undergraduate and post-graduate students. I was also given the tour of their agricultural engineering projects, farms, very interesting R&D projects in sustainable and precision agriculture, and tea garden and tea processing improvement strategies. There is a possibility of collaboration between our Institute and IITKgp on few of the projects. The Institute lecture took place in Netaji Auditorium in the main building complex. About 100-150 students, senior faculty including deans and officiating Director Dr. Arun Majumdar were present. The trip to Sikkim started from Bagdogra airport which is in West Bengal. There is no airport in Sikkim. I am told Gangtok airport will be ready by 2012. Hence presently the only way to visit Sikkim is to fly into Bagdogra and then go by car to different parts. Bagdogra is around 120 km from Gangtok. We had kept 5 days to visit Sikkim. A dear friend of mine Shri. P. D. Rai (an alumnus of IIT Kanpur) who is the sole Member of Parliament from Sikkim had introduced me to a tour operator who arranged for our travel itinerary and living arrangements. Thus we visited Pelling in the western part of Sikkim from where one gets (weather permitting) a majestic view of the Himalayas including the world’s third highest peak Kanchenjunga. However during our visit there was a thick cloud cover so only in the morning we could get briefly a glimpse of the mighty Himalayas. We also visited the beautiful and holy Khecheopari lake near the Nepal border and the Pemayangste Monastery. The annual Chaam festival was being celebrated in the monastery with traditional Tibetan dances and drama. We also visited the ruins of the 17th century Sikkim capital Rabdenste situated in the thick biodiversity forest range. A short trek of one km took us to the ruins. After an overnight home stay at Singling near Soreng, we started on a visit to the Varsey Rhododendron Sanctuary sandwiched between Singalila National Park in the South and Kanchenjunga Biosphere Reserve in the north. It is spread over 104 sq km area. It is famous for its Rhododendron trees which bloom during months of April/May with brilliant white, red, pink and yellow flowers. It being early March hence it was too early to see any flowering trees and so our visit to the Sanctuary was quite a disappointment to us. However we did see many Rhododendron trees in full bloom in various places in Sikkim. Nevertheless the trip itself was exhilarating. We reached the base of the Sanctuary to the village called Hilley which is at 2744 m (9000 ft) elevation. From here there is a narrow path of 4.5 km to Varsey which is at the height of 10,000 ft. The climb is gentle but the path goes through a very thick forest inhabited by wild boars, black Himalayan bears, red pandas and occasional leopards among others. Our porter initially refused to go with us since he had seen a bear the day before. After coaxing him he accompanied us. We were not fortunate to see either the bear or the leopard though our guide did pick up some fur of a leopard which seemed to have crossed the path 10-15 days ago. We did the trek in 1.5 hours and felt invigorated with a brisk climb. On reaching Varsey we were disappointed that because of cloud cover the magnificent view of the Kanchenjunga was not visible. Besides it was icy cold and around 2 p.m. a thick mist engulfed us. We stayed in a small hut made for Forest Department guard with neither electricity nor running water. A better facility of Government rest house was under renovation and hence it was not available. Since we were the only tourists at that time, we were lucky to get a room in the Forest hut. As it had few small windows it was very dark inside. Hence we sat outside in the open in freezing weather till 6 p.m. when it became dark. We kept warm with a good bon fire and umpteen cups of tea that the caretaker provided. We sorely missed our lanstove since it would have provided excellent light, good heat and would have cooked all our food. I think the lanstove will be a boon in cold climates. The existing kitchen was continuously using wood in a very inefficient manner for cooking and boiling water and could have provided warmth to us but it was impossible to sit inside it since it was completely smoky. The hut did not have any kerosene lantern and so we ate in candle light and slept at 7:30 p.m. The dwelling was freezing and even with double layered clothing and 2 thick quilts we still kept on feeling cold. In the morning we started our trek back to Hilley at 7 a.m. thinking that we may be able to see some wild life. Except for seeing the hoof marks of some barking deer or the Tahr (mountain goat) nothing else was seen. From Varsey we traveled to Gangtok via Namchi, Timi (famous for its tea gardens) and Singtam. We stayed in Gangtok in the beautiful house of Shri. P. D. Rai who is the Member of Parliament (MP) from Sikkim. P. D. is an alumnus of IIT Kanpur and a very remarkable and a warm human being. He is the only MP with degrees from IIT and IIM, Ahemadabad and had worked for many years in the corporate world. I feel if we have more MPs like him who are very well educated and professionally trained then this country will become much better. P. D. is one of the founders of Sikkim Democratic Front (SDF) party which has ruled Sikkim for last 14 years. He has set up a think tank of very smart professionals, government employees and NGOs. He wanted us to meet them. We had a very nice interaction on Sikkim and Nation building and I also talked with 10 of his bright student interns who are doing MBA’s and other professional studies. It was an enjoyable brainstorming session which lasted for 4 hours. P.D. also gave the seed of our sweet sorghum and safflower hybrids to a progressive farmer in Sikkim. If these varieties are planted successfully then it will be the first time when safflower and sweet sorghum will be introduced in Sikkim and may provide alternative crops besides barley, kodo millet, maize and rice that the farmers normally plant now. Gangtok is a nice hill station, though now teeming with high rise buildings dotting the slopes. It is a modern city with all the facilities that such towns have. The main market in Mahatma Gandhi Road (MG Road) has a European flavor to it. It has broad walkways with no vehicular traffic allowed anytime. Hence it is a walker’s paradise with lots of benches to sit on and small dainty flower beds dotting the streets. Sikkim is a beautiful state with horrible roads. Most of our journey was done on kutcha roads and at some places they were really rough where the car could navigate only at 5-10 km/hr. Sikkim has 24/7 electricity, clean water, very clear air, excellent mobile connectivity but horrible roads. I feel that if their road infrastructure can be improved then their economy will boom. With their cool temperatures, excellent water and electricity availability, Sikkim has the potential of becoming a horticulture paradise. Thus almonds, walnuts, apples, peaches etc. can be grown on large scale. Nevertheless for horticulture or any farming activity to thrive there is a need to transport the produce to the markets for which good road network is needed. I was told that the leaders of Sikkim want to make it the Switzerland of the East. However for that to happen some basic amenities like good and reasonably priced hotels and home stay places with some creature comforts and good roads are needed. Besides it also needs reasonably priced tour packages. We felt swindled by the tour operator who charged us Rs. 12,000/- in taxi fare for 400 km trip! The quality of higher secondary education in Sikkim is excellent. Thus even in a small place like Soreng there was a Don Bosco School. The bright energetic students are the future of Sikkim. I am told that quite a good number of them successfully enter into competitive exams like IITs, IAS etc. Thus they get out of state and very few of them ever come back. It will be beneficial for Sikkim if they come back and help in Sikkim’s development. That is what PD Rai is trying to do. Dr Anil Rajvanshi, it was pleasure to read your article on Cal, KGP and Sikkim. I had two classmates when I was a student at IIT (KGP), very long back during 1960-64. The IIT building brings very nostalgic memories - it was a place where the teachers were godly. During our time Prof Pandya was the head of sept of the agricultural dept. One Ph. D. student, Dr, Panjab Singh, who later became Director General of Indian Council of Agri. Research (ICAR) and VC of BHU was my hostel mate and more than that we both played volley-ball for IIT and had won many tropphies. As reagrds your visit to Sikkim, you are right; only communication - road to electronic, make a state rich. This has not been unfortunately understood by our policy makers. Good that you met the only MP, that too a highly educated one, in Sikkim. Thanks for sharing your experiences. I contribute essays and poems on Boloji.com.